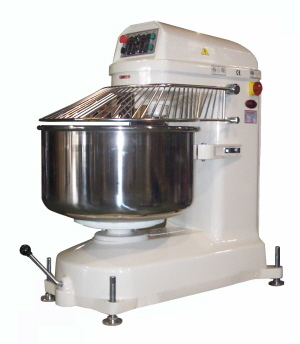 Unisource heavy duty spiral bagel mixer. Capacity: 176 lb. of flour. 275 lbs. of dough. Features: heavy duty stainless steel arm, dividing plate and bowl. Stainless steel safety guard, analog controls. No computer board malfunctions! Voltage: 208, 60 cycle, 3-phase. This mixer has only been used at trade shows. Full 1 year parts, 90 day labor warranty. Perfect condition.